Car Brand DACIA Launches an Unnecessary Line of Accessories in Portugal. In recent years, Renault has received a breath of fresh air from Dacia, whose sales have steadily increased. From a low-cost brand, as it was presented in 2004 at the launch of the first Logan, Dacia is now working to be seen as a smart choice by the European customers, that are no longer looking for models that show their status. This trend has decreased in intensity and the customers are now looking for a vehicle with a decent level of safety, reliable and comfortable, preferring to spend their money on other things. DACIA cars are the smart choice for those who are thinking about buying a new car. They have everything a person really needs - such as the Media Nav multimedia system, the rear-view camera, generous interior spaces, robustness, and much more at a fair price. But how do we convince people to buy a DACIA, when other brands are constantly luring them with fancy extras that they will never use? 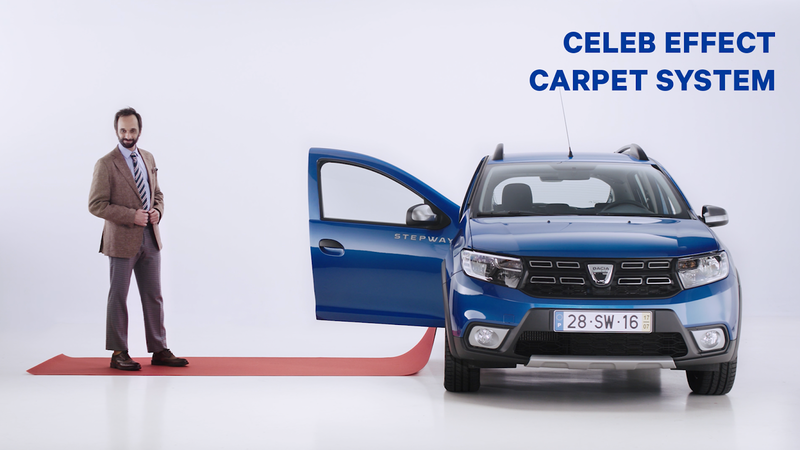 This is the motto of the new DACIA campaign for its model Sandero, which announces a new line of accessories exclusively made to satisfy the desire of those who really insists on having unnecessary equipment in the car - The DACIA Unnecessories. Celeb Effect Carpet System – a carpet for those who want to get out of the car as a celebrity. Dog Window Cruiser Support – a holder to place on the Dacia Sandero rear window so dogs can comfortably and pleasantly enjoy every gust of wind of the trip. Or the Car Trip Companion Assist - an inflatable and pleasant company so that no one else has to travel alone again, are some of the fun Unnecessories available for ordering on the website created for the campaign. On the campaign site www.unnecessories.com people are able to know in detail the whole Unnecessories line, use the configurator to see how they stay in DACIA Sandero, and even order their favorite Unnecessory freely, in exchange for a test-drive. Or, they can simply get to know the DACIA Sandero, because after all, this one already has everything they really need. AdStasher: Car Brand DACIA Launches an Unnecessary Line of Accessories in Portugal.